Many people turn up in a yoga or Pilates class with a karimat, or in a better case scenario, a regular gym mat. I cringe when I see this and rush to take it away from them before they even roll them out! They might look similar, but these types of mats are COMPLETELY UNSUITABLE for the work you’re about to do. They are a recipe for injury, as they weren’t designed for this purpose and won’t provide the stability you need. 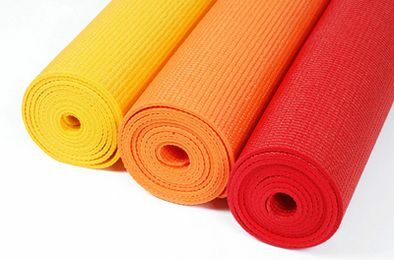 You will find that many mats are sold as suitable for both yoga and Pilates. That is not really the case. A Pilates mat should be firm and non-slip like a yoga mat, but it needs to be thicker, as much of the work is done on the floor and you need the padding for your spine, knees and other protruding bits. Because of this cushioning, it doesn’t provide such good surface for balancing exercises and poses, so it is not very suitable for yoga’s standing postures. I solve this problem by using two mats and creating a cross, which gives me the option of moving in four directions instead of just two, and makes a nice thicker layer right in the middle for any seated or supine stuff. So, whether you practice both yoga and Pilates, having two mats might be an ideal option for you, too. If you are very tall, always check the length of the mat you are buying. A standard mat is only about 6 foot (183cm) long, so do the math and decide what will stick out when you lie down! Look for an extra-long mat — I have one listed below. Conversely, you might need a smaller mat for a child. Children love having their own mats and will be a lot happier doing yoga on something more adequate to their size, especially if it has some cute pictures on it! Do not be tempted to buy a very cheap mat at a supermarket. I have made this mistake in the past. Like with anything, you get what you pay for — but in this case, your safety might be compromised. Many are knock-offs of the real things and will not stick well, either to your hands or the floor, and will start to disintegrate after a few washes. By all means find a bargain, but make sure the mat was made by a manufacturer specialized in yoga and Pilates products, not by, say, Tesco. It will make a huge difference to your practice. Here are some of my tried and tested brands that you can buy in confidence. A stylish bag to carry your mat in. You can always use a yoga belt or another band, but a bag is so much nicer! Wai Lana mats are my number 1 choice — they are beautiful, well cushioned and super-sticky, even when brand new. Many mats have a slippery film that needs to wear off or wash off, and it can take a while for the mat to become fully functional. Not this one, though. Highly recommended! The Warrior mat is a quality standard mat for everyday use and light enough to carry. Somewhat less sticky on the first use but “breaks in” quickly, so nearly just as good as the Wai Lana mat. Lots of plain solid colours available! I use Warrior mats for most of my classes. For those wanting or needing extra padding. Ideal if you cannot use two mats. The mat is quite beautiful, too! I absolutely LOVE this mat. This one is for the serious yoga practitioner — it’s the best of the best, as reflected in the cost. It offers fabulous cushioning while being very firm, which is a priceless combination for yoga as well as Pilates. And the grip is amazing. This is the best mat I’ve ever owned and practiced on. The only downside of this mat is its weight. It’s not a mat you can easily carry around as it’s quite heavy and bulkier than your usual yoga mat. It’s ideal for home use, and will last you a lifetime. The perfect Pilates mat. Stott Pilates equipment is all top-quality, so you won’t have any trouble with this one. Soft and comfortable for everything you will be doing. For the tall ones among you! If you don’t want to be inching your way back and forth into your mat space, do yourself a favour and invest in this one. A fun, and at the same time proper, yoga mat for kids. They are very fidgety, and will need the same, if not more, support as you do, so if they do yoga with you, so don’t leave them out on a carpet!